Active avoidance test (Shuttle box type) | O’HARA & CO.,LTD. The movement of the subject within the box is detected by using photo beam sensors. 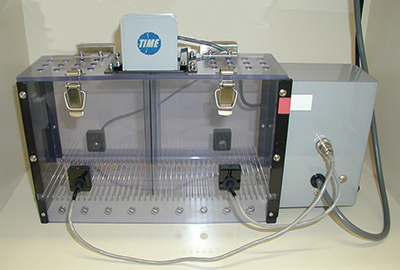 All sensors and cables in the box are detachable, allowing for easy cleaning and maintenance of the apparatus. Furthermore, each box is placed inside a sound attenuating chamber for stable environmental conditions. By using the software, the experimenter only needs to place the subject in the experiment box and the rest of the test is automated.